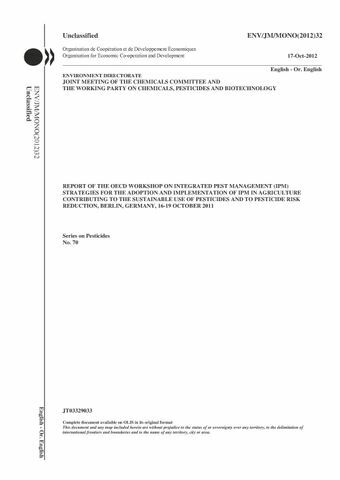 This document is the report of the “OECD Workshop on Integrated Pest Management (IPM) - Strategies for the adoption and implementation of IPM in agriculture contributing to the sustainable use of pesticides and to pesticide risk reduction”, that took place on 16 19 October 2011, in Berlin, Germany, and was chaired by Dr. Wolfgang Zornbach of the German Federal Ministry of Food, Agriculture and Consumer Protection.The developed detailed recommendations for promoting and facilitating the adoption and implementation of IPM strategies and for encouraging appropriate stakeholders to use IPM tools and measures. The workshop was planned in the framework of the “OECD Strategic Approach in Pesticide Risk Reduction”. It addressed the following four main issues: technology and Information, economics and market access, policies and strategies and measurements and impact. This report includes the outcomes of the workshop discussions, as well as the overall workshop conclusions (Section 4) and recommendations (Section 5) targeted at governments, all stakeholders and OECD.